Egyptian President says his country foiled an attempt by ISIS to seize territory and set up an extremist state in the Sinai. Egyptian President Abdel-Fattah Al-Sisi on Saturday said that Egypt had foiled an attempt by the Islamic State (ISIS) group to seize territory and set up an extremist state in the Sinai, reports The Associated Press (AP). 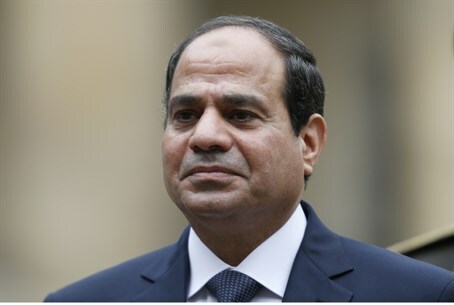 Speaking to members of the army in a televised speech which marked his first public remarks since Wednesday’s multi-pronged jihadist attack in the restive peninsula, Sisi said the jihadists had tried to announce “an Islamic state, in their concept, an Islamic State in Sinai” . “These are the messages, very simply, that they are putting out to us,” said the president, adding that the area was now under control. Wednesday’s attack, which was claimed by the Sinai Province, ISIS’ affiliate in the Sinai Peninsula, lasted a whole day and was unprecedented in its size and coordination. The attack hit a string of army checkpoints and involved multiple suicide bombings and the siege of a main police station with heavy weapons. Egypt’s Foreign Ministry on Saturday blamed the past week’s violence on the outlawed Muslim Brotherhood, which it said was not only the main source of Islamic extremism, but also coordinated operations on the ground. “All of these attacks were conducted days apart, and showed a level of sophistication and coordination that affirms the presence of organized terrorist activity perpetrated by the Muslim Brotherhood,” it said in a statement given to reporters on Saturday and quoted by AP. Foreign Minister Sameh Shoukry said the timing of the recent attacks make the associations between the Brotherhood and Daesh extremists “apparent,” using an Arabic acronym for ISIS. “This is a matter of motives... I, as I think any Egyptian on the street, will make the educated presumption that this was perpetrated by the Muslim Brotherhood. Many of the (online) sites of Muslim Brotherhood rejoiced at the fact,” he said, according to AP. Hours after Wednesday’s attack, Egypt's government adopted an anti-terror law which it said would provide "means to drain the sources of terrorism financing." Sinai Province, formerly known as Ansar Bayt Al-Maqdis, has claimed responsibility for most of the terrorist attacks in the Sinai over the last few years. On Friday, the group claimed responsibility for a rocket attack from the Sinai Peninsula into southern Israel.